So apparently I am a little behind in the current baby food trends because when I handed the one year old a squeeze pouch of Sprout Baby Food, he knew just what to do! These little squeeze pouches are awesome for a snack in the park or on the road on those very busy days! We take these pouches with us everywhere as a “just in case” snack. Spout Organic Baby Foods are by far my favorite! First I will tell you the all natural colors are very easy to clean up out of white carpet. But then we should be asking hubby why in the world we still have white carpet with a 1 year old, right? 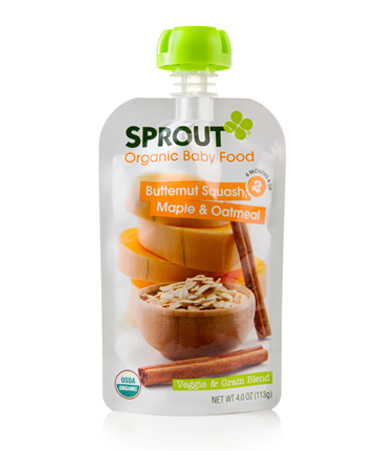 Lil Mans favorite Sprout Organic Baby Food pouch is the Butternut Squash, Maple & Oatmeal. When we first got lil man, he had a lot of trouble chewing so these were great. Now in such a short time he is eating more and more solids including Sprouts Toddler Foods! As we were introducing lil man to the 4th stage foods, I was more comforted with the fact that Sprout meals provide valuable vitamins and minerals in each and every meal. 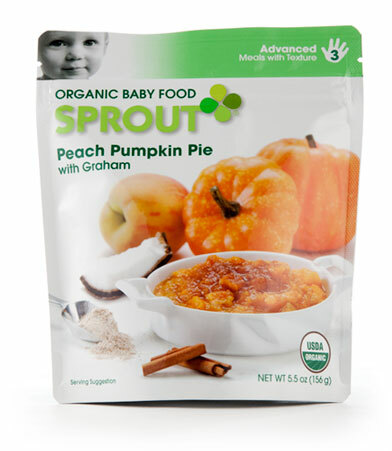 Sprout Organic Baby Foods are perfect for the beginning eater and one that wants just a little independence. I love Sprout for the organic ingredients and the assurance in knowing I am providing lil man all the right foods. Your so funny! Our baby loves these pouches to! my nephew's little ones love fruit pouches but i dont think they have had anything as yummy sounding as peach pumpkin pie!